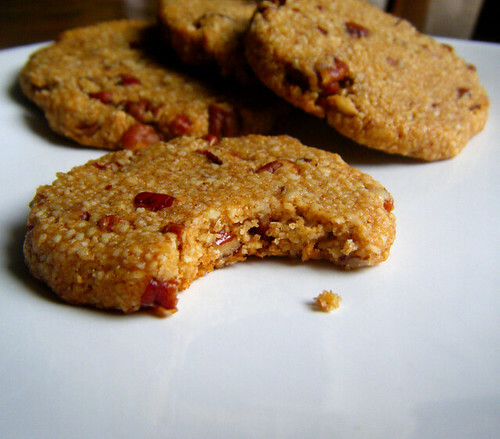 If you, like us, are still scrambling to make treats for your holiday dessert tray, give these sweet and spicy cookies a try. No one will know they’re a healthier alternative to the white flour, white sugar-laden treats that abound this time of year. Made from high protein almond and cashew flour, these lightly sweetened soft ginger cookies will remind you of those classic crinkles you’ve been eating for years. And with only a few tablespoons of sugar in the entire batch, they won’t send your insulin levels soaring. Leave a tray out for Santa by the chimney, and he won’t be disappointed. These soft and chewy morsels also make great last minute gifts. Just dress them in a glamorous box and savor your budget-friendly decisions. I picked up the silver filigreed boxes and wrapping paper at Dollar Tree, believe it or not. They’re a one stop shop for gift wrap and holiday party supplies. As a newly minted medical student (! ), it was especially important to find budget-friendly gifts this year. Much more will be said about medical school in another post. Let’s just say I was never so glad to have winter break! It’s been whirlwind since August, but the sleepless nights and countless cups of coffee will hopefully be worth it when I’m a physician who can help patients address their health conditions and live better lives. Feeling so blessed to have the opportunity to pursue my passions. It’s the best Christmas gift of all. I used a small amount of real sugar in combination with sugar-free sweeteners to decrease the amount of carbohydrates while preserving that familiar molasses cookie flavor. You can, however, adjust the recipe to leave out the sugar-free sweeteners if you prefer. Truvia, a blend of the natural sweeteners stevia and erythritol with a little added coconut sugar perfectly sweetens the cookies without leaving an aftertaste. In this recipe, I used the Target version of Truvia (look for the red and white container in the baking aisle) which is a bit cheaper than the brand name. 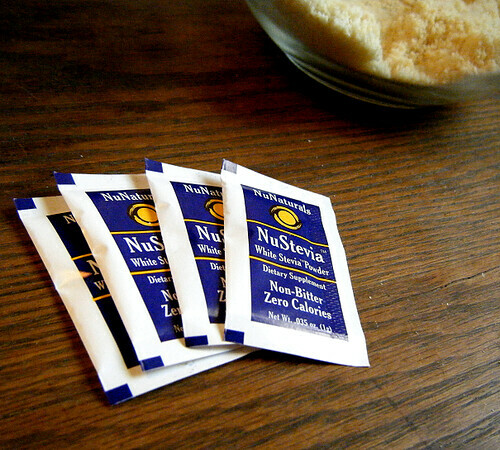 You can also make your own Truvia-like sweetener at home following my recipe posted here. To make these cookies paleo, leave out the Truvia and oat flour, and add in 2 Tablespoons arrowstarch + 1/3 cup coconut sugar. I adapted this recipe from an incredible paleo cookbook by the immensely talented Julie Hulet, so pick up My Paleo Patisserie if you’re looking for recipe inspiration. To make these cookies dairy-free, use non-hydrogenated organic palm shortening in place of the unsalted butter. These nutrient-dense cookies are packed with almond flour, oat flour, and coconut flour! This flour blend creates a soft and chewy gluten-free cookie that even your non g-free friends will enjoy. 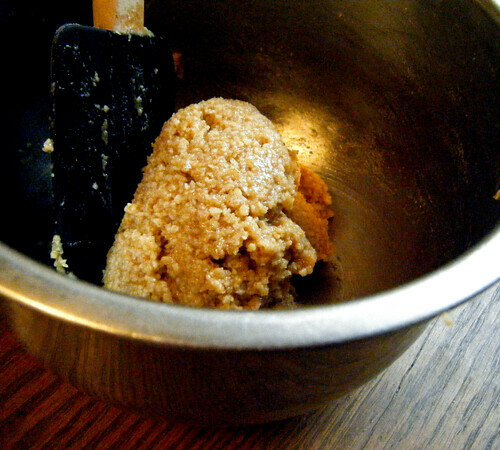 Add butter, coconut sugar and Truvia to a mixing bowl. Beat with an electric mixer 1-2 minutes, or until light and fluffy. Slowly add in dry ingredients, and beat in until a dough comes together. Chill dough for 1/2 hour. Remove dough from refrigerator, and shape into 1.5″ balls with your hands. Toss each dough ball around a small bowl filled with the 2 Tablespoons of granulated sugar. Place dough balls 2″ apart on a parchment lined cookie sheet. Flatten each dough ball with the bottom of a glass to 1/2″ thickness. Bake 13-14 minutes, and let cookies cool for a few minutes on cookie sheet before transferring to a wire rack. Store in baggies or tupperware. Cookies should keep for a week unrefrigerated. Freeze cookies if you’d like them to be extra chewy! 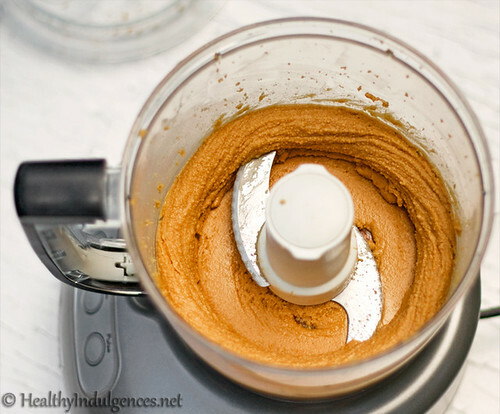 **You can replace the cashew flour with more blanched almond flour if you like. The cashew flour greatly enhances the taste, though. Get it at Trader Joe’s or online. 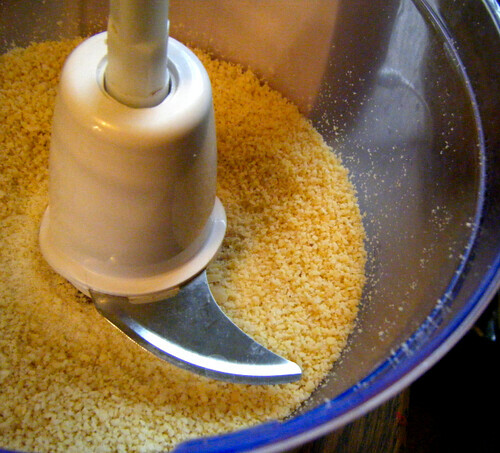 ***Grind up Truvia into a fine powder using a clean coffee grinder or Magic Bullet if you would like to ensure that the cookies don’t taste gritty. Healthier Peanut Butter Cookies (aka Fresh Peanut Butter Cookies!) 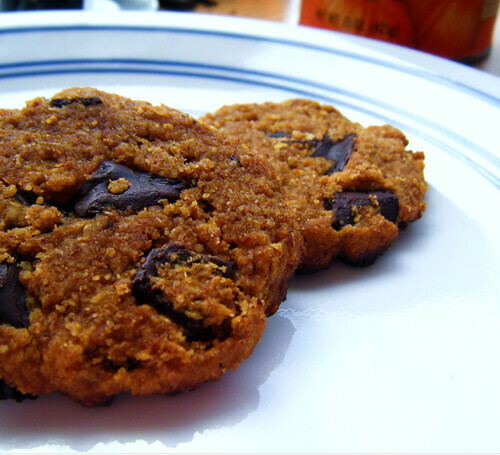 – A lower sugar, high protein version of classic PB cookies. These peanut butter cookies are just like grandma’s, but changed up just a little to boost the protein and reduce the sugar. Oh, and they’re gluten-free. 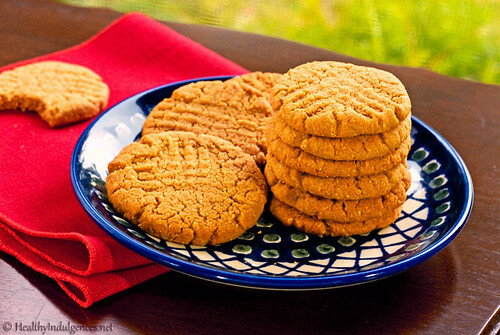 Make this one your new classic peanut butter cookie recipe! You’re still holding on to that old recipe card, aren’t you? Hmm, well, did I tell you that the dough is made in a food processor, so preparation is a breeze? Yup, it’s true. Making fresh PB in my Kitchenaid food processor, a Christmas gift I’ve finally gotten around to using. Much more powerful than my smaller food processor, it makes nut butter in minutes. Love! Did I mention you can grab all of the ingredients for these healthier cookies during your next trip to the grocery store? Also true. Sorry, grandma. I love ya, but that cup of sugar and white flour have gotto go! 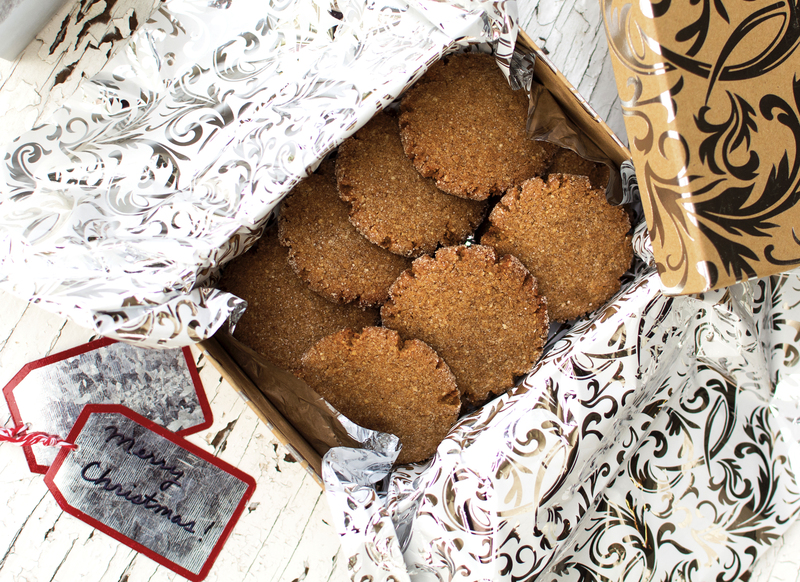 …and ALL of the addictive, salty n’ sweet peanut butter cookie taste. UPDATE: The giveaway is closed, and the winner has been contacted. Thanks for playing, everyone! At the request of a reader, I wanted to share with you my sugar-free, gluten-free Healthier Sugar Cookies. That sounds like an oxymoron, right? Stay with me here. These cookies smell and taste just as good as the cut out cookies I’ve made every year since I was little using grandma’s recipe. The aroma of sweet cookie dough (i.e. buttery vanilla-y goodness!) filled the kitchen as I gingerly rolled out the dough. 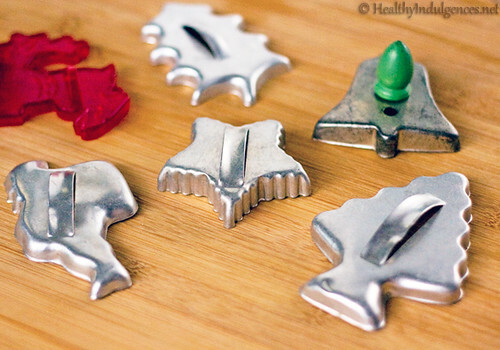 I used my grandmother’s antique cookie cutters to cut the familiar shapes that remind me of so many past Christmases. The dough I worked with was sugar-free, but the steps for making the cookies, and the accompanying feelings of nostalgia were the same. 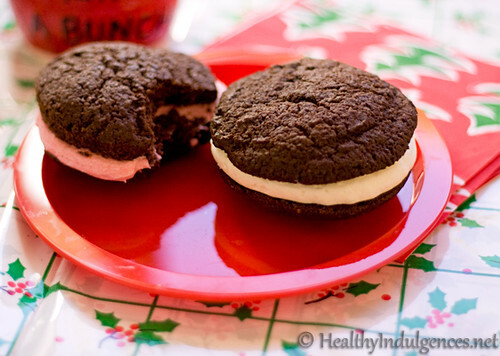 Healthy Chocolate Whoopie Pies are here! Sugar-free, gluten-free, and finger-lickin’ good. 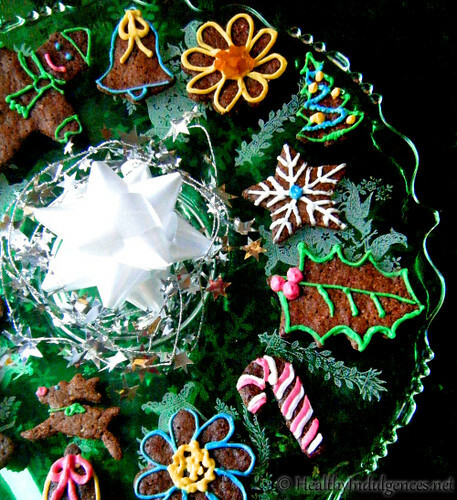 Merry Christmas and Happy Holidays, Healthy Indulgences readers! School’s out and baking season is here. After a semester of new beginnings during which I moved back home to Florida and started my post-baccalaureate coursework, it’s time to get back in the kitchen and go on a baking spree. I’m trading in my calculator for my camera and ditching the library for the kitchen these next few weeks, bringing you holiday sweets and a couple of GIVEAWAYS! To kickstart the baking bonanza, here are some sugar-free, gluten-free Healthy Whoopie Pies to satisfy your sweet tooth. They’re all the rage, and perfect for an easy, kid-friendly holiday dessert. My version of these cakey cookie sandwiches with a sweet buttercream filling tastes every bit as good as the traditional dessert chock full of flour, sugar, and shortening! Made with ground almonds, a little oat flour, pure unsweetened cocoa powder, and natural sweeteners, you can feel good about indulging in these treats after your holiday feast. Actually, they’re wonderful any time of the year. In fact, you should make these right now. You need fuel to get through all that gift-wrapping and baking, right?! 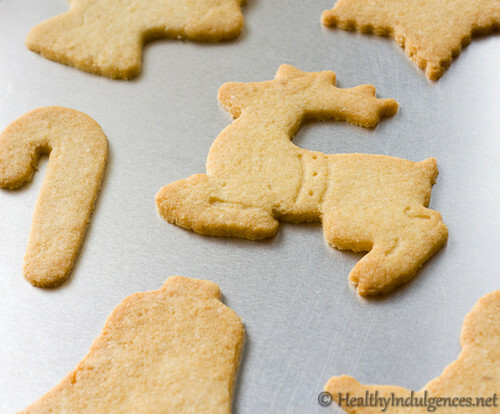 This is my entry to Eat Christmas Cookies, an event sponsored by FoodBlogga! Check out all of the drool-worthy recipes there. Get the little ones into the kitchen with these easy-peasy healthy gingerbread cookies, dolled up with colorful sugar-free cream cheese frosting! 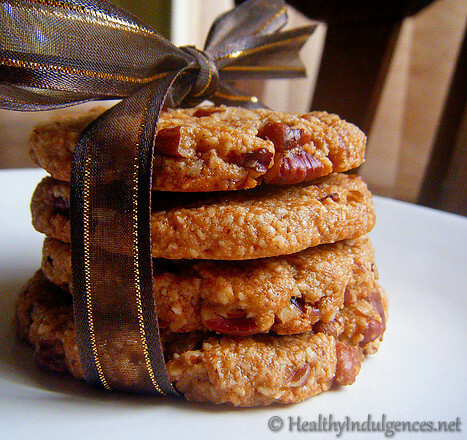 These classic Christmas cookies are adapted from my versatile recipe for Honey Nut Cookies. 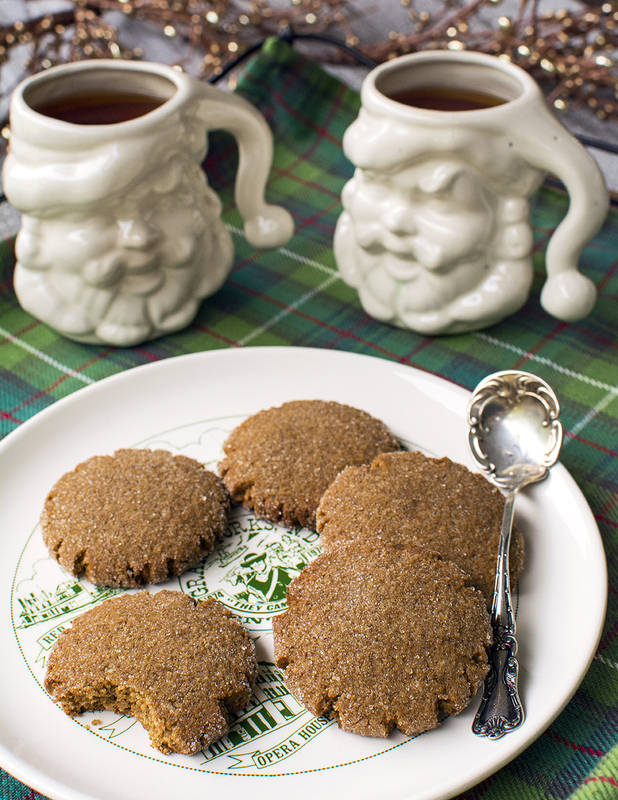 The only changes are the addition of blackstrap molasses and lots of yummy spices to impart that distinct gingerbread flavor to these gluten-free, egg-free, low carb cookies! The texture is chewy and crispy all at once. They’re a bit different from traditional gingerbread, but just as delicious and fun to decorate. A word about the food coloring: Don’t try to make it “all natural” by using the organic food coloring you see at the health food store. With good intentions, I bought some natural blue food coloring on sale for $3.99 (yow!). It’s made from “pure blueberry extract,” so I thought it sounded like it would be a healthier substitute for the artificial stuff. It dyed my cream cheese frosting a lovely brownish purple hue. If you want to go the natural route, don’t say I didn’t warn you! Preheat oven to 275 (yes, 275) degrees Fahrenheit. Melt butter and mix with honey, molasses, and vanilla until smooth. Add dry ingredients. Dough will be soft and sticky. Cut out two long pieces of parchment paper. Roll dough to 1/8th of an inch thickness (or thinner) sandwiched in between pieces of parchment paper. Peel off top sheet of parchment and flip dough from bottom sheet to the top sheet so that dough has been peeled off of both sheets of parchment, ensuring that it will be easier to transfer to cookie sheet. 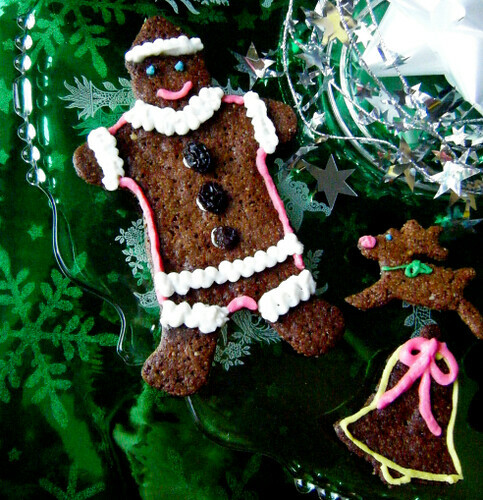 Cut out shapes with cookie cutters and peel away bits of dough around cut outs, or flip cut outs onto cookie sheet lined with parchment. Bake for 18 minutes. Let cool completely for about 10 minutes or so before moving to a work surface. Decorate with piped cream cheese frosting and bits of chopped raisins and dried apricots. Leave cream cheese at room temperature for 30 minutes. Powder erythritol in coffee grinder or Magic Bullet. Beat together cream cheese, vanilla, and erythritol for 1 to 2 minutes, or until very smooth and erythritol has mostly dissolved. Mix in stevia starting with 1/16 of a teaspoon, taste, and adjust sweetness level if necessary. Spoon frosting into separate bowls, and beat in drops of food coloring, wiping off the beaters after each color has been mixed. Transfer colored frosting into zip top bags and snip off the corners. Use immediately. 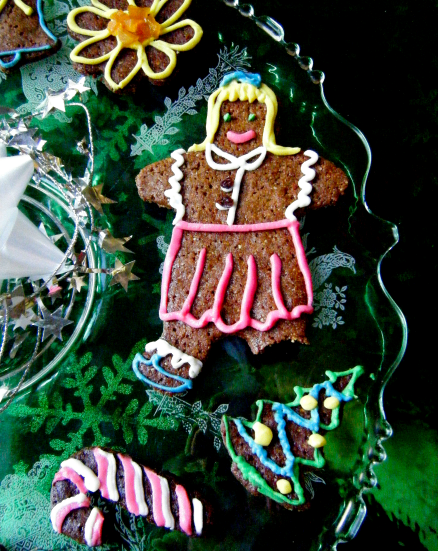 Poor gingerbread lady. 🙁 She was too yummy for her own good! This is my submission to Kimi’s Nourishing Sweets and Treats event at her wonderful blog, The Nourishing Gourmet. Exams are over and I’m back in Florida, where the mood is festive despite the 80 degree beach weather. I’ve planned a bit of Christmas baking for you guys, so stay tuned! In addition to attempting to make over classic holiday treats like chocolates and gingerbread cookies, I’ll be mixing it up with a few original healthful creations that will hopefully tantalize your tastebuds just as much as familiar favorites. Once you get the hang of working with almond flour and alternative sweeteners, non-traditional baking gets a lot easier. Make these upcoming weeks, filled with office parties and decadent meals, nourishing for your soul and your body, with good friends and healthful food. 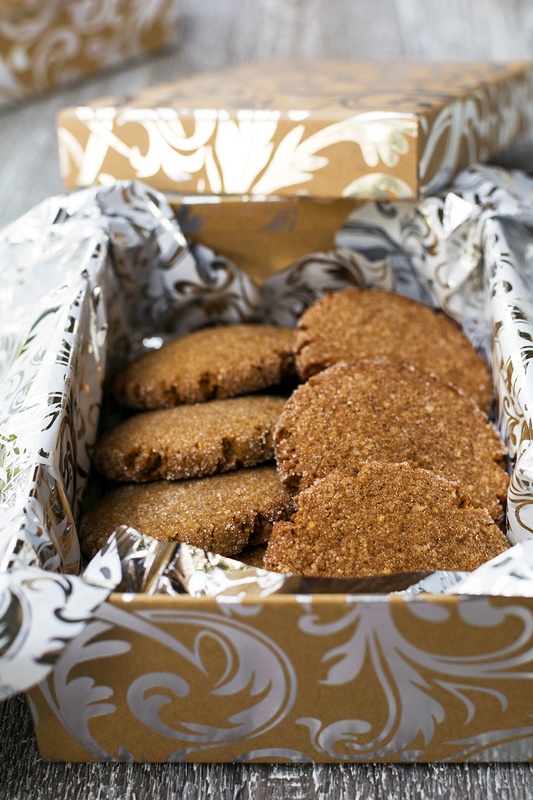 This first recipe calls for a bit of honey as a sweetener, which works so well with stevia to achieve the perfect flavor in these gluten-free, low carb Honey Nut Cookies. These cookies are also, incidentally, egg-free! I’m still waiting for my erythritol to get here, and thought it would be good to share some recipes that don’t involve it. Erythritol is all natural and delicious, but it is so expensive that in these hard times, it’s nice to have a more reasonably priced healthy option. If I am using honey, I make sure to use as little as is necessary to sweeten adequately, and just count the carbs. If you’re worried about the fructose content, just know that per serving, you’re probably not ingesting enough to worry about. I feel much safer using a bit of honey and blackstrap molasses here and there than artificial sweeteners. It’s a personal decision! In the pioneering footsteps (hah!) of Ree Drummond, I’m doing a step-by-step photo spread for making these cookies. They are so simple that this tutorial really isn’t necessary, but my sister and I had fun killing time this first afternoon back home, bumming around the house for the holidays! Let’s make some cookies, shall we? First things first: We need to make almond flour, the star ingredient in a low carb healthy baking arsenal. It’s so flippin’ easy. 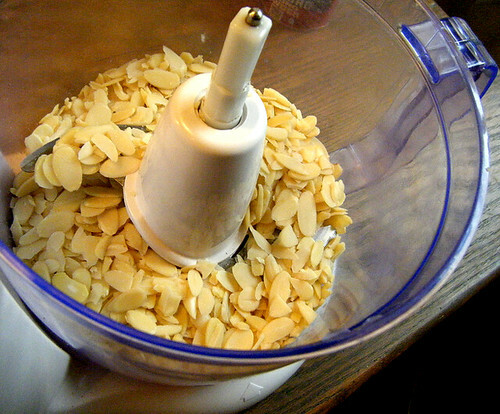 Step One: Add sliced, blanched almonds to food processor. Refrigerate or freeze the nuts beforehand for the best results. Step Two: Whizz ’em up for a minute or two until finely ground. 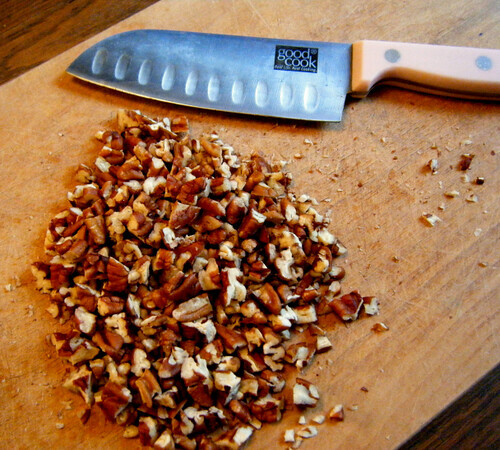 Chop pecans, and toast them for 12 minutes. Melt butter. Stir together all ingredients except almond flour and pecans. Mix in almond flour until a smooth dough forms, then fold in nuts until dispersed throughout dough. 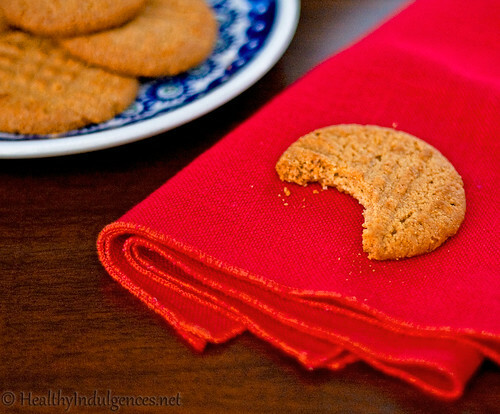 Shape into flat cookie rounds on parchment paper. Bake for 12-18 minutes, or until slightly browned around the edges. Let cookies cool and harden for a full 10 minutes before removing from parchment. Thanksgiving and holiday baking are on the horizon. My upcoming recipes will be incorporating my absolute favorite seasonal ingredient: pumpkin! Yes, it’s everywhere right now on the food blogs, but for good reason. Pumpkin embodies the taste of fall, with its smoky warmth, mirroring the auburn spectrum painting the leaves. It lends vibrant color and an air of comfort food to every dish it touches. Not to mention the health benefits! It’s low in carbs and packed with beta carotene. You may associate it with just desserts, but it pairs beautifully with caramelized onions and black pepper, making a mean dish of breakfast faux-tatoes (more on those later!). Due to limited access to a real grocery store and fancy ingredients this semester, I am paring down my cooking arsenal and sticking to what I can find on campus. 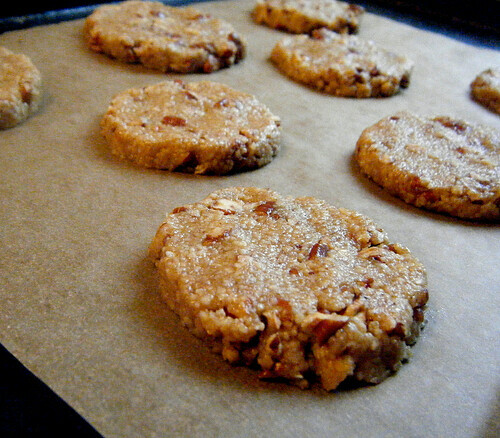 A bit of honey can do wonderful things for low carb gluten-free cookies. It acts as a binder, and complements stevia’s sweetness–a little bit of honey goes a long way. Yes, it is real sugar, but it is not heat processed, and low enough in carbs distributed throughout the whole recipe. As long as I count the carbs (6 grams per teaspoon), I am fine with honey and experience no cravings or portion control issues. Your tolerance may vary, of course! I’ll be sticking to raw honey when I need a little of the properties that real sugar affords. Count the carbs for your daily total and be on your merry way. A bit of real sugar is not inherently evil for healthy individuals, when used responsibly. 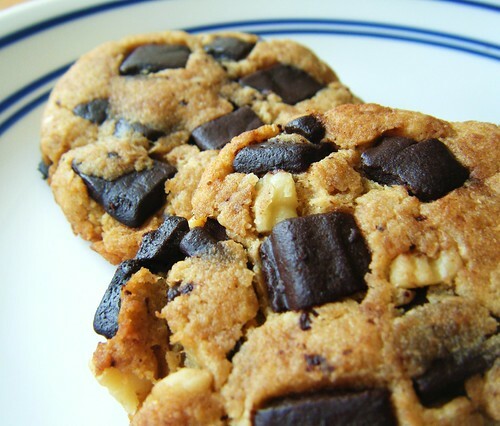 Enough chatter… let’s talk cookies! These are not your momma’s pumpkin cookies. They are dense and moist, but NOT cakey! These are just sweet enough with a bit of rich chocolate in every bite, which nicely complements the spicy undertones. And the best part? They’re miraculously gluten-free (of course), dairy-free and egg-free. That means almost vegan, but I’ve heard that vegans care about bee welfare, too. Bless them! What did I do for the chocolate chips? I’ll admit to being lazy and just breaking up a 70% Lindt bar, but if you are watching your carbs more closely you can use my homemade erythritol-sweetened chips. 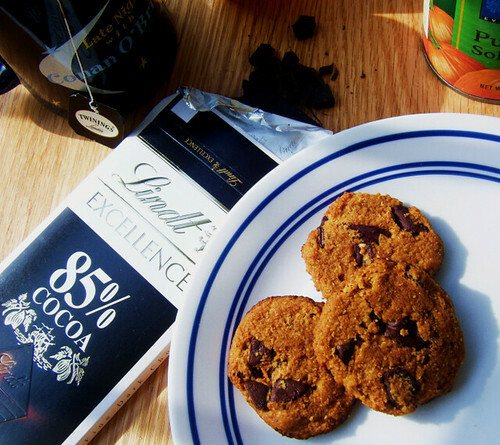 You could just use a chopped up 85% cocao Lindt bar if you can handle that intense chocolate flavor. Pulse coconut until it forms a coarse flour (using flat blade in Magic Bullet). Level off 1/4 cup. 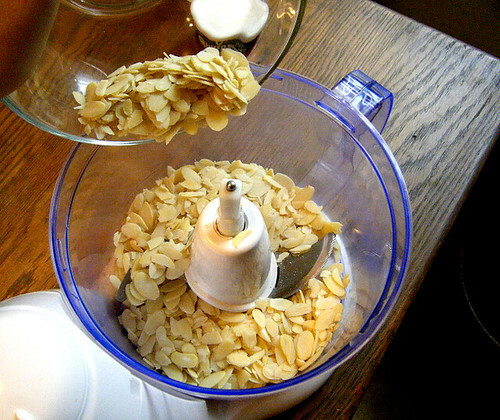 Pulse chopped almonds into a meal if you don’t have pre-ground almond flour. Break chocolate into chunks with your fingers. Melt shortening. Whisk in honey, pumpkin puree, and vanilla until smooth. Stir in dry ingredients, excluding chocolate, until dough forms a smooth paste. Mix in chocolate chunks. Dollop with a tablespoon onto greased aluminum foil or parchment paper, spreading and patting into flat cookie shapes (these don’t spread). Bake for 15 minutes, then move cookie sheet to top oven rack and bake for 5 more minutes. Let cool completely on cookie sheet. Store in plastic baggies lined with paper towels. What are you cooking up for the holidays? Leave a comment and share! UPDATE: I had a friend try these with Splenda, her preferred sweetener, and they turned out well. She said they could have been sweeter, but the sweetness level was just right for her taste. When I’m stressed, I bake. There’s something comforting about the mindless measuring, the systematic method of the steps, and of course, the instant gratification. Not that I’m too uptight this time of the semester. It’s just really nice to step away from my reading material a few moments for a sweet reward. Cookies fit the bill nicely! After working and re-working this all natural sugar-free gluten-free chocolate chip cookie recipe, I am now satisfied with the results. 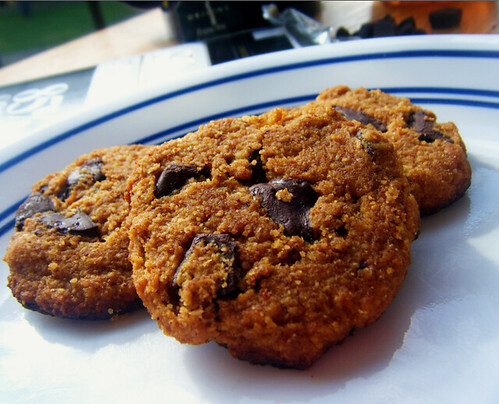 Cookies without real sugars (including natural sugars–agave, honey, etc.) OR artificial sweeteners are a tough nut to crack! I really try to avoid both because of the metabolic response caused by sucrose and fructose (e.g. agave nectar! ), as well as the artificial nature of manmade molecules such as Splenda. This may be an overly cautious approach, but being the science junkie that I am, stevia and erythritol seem like the safest options for now. If you like Splenda and other artificial sweeteners, and they help you to stay on your low carb plan, use ’em. You’re likely healthier than you would otherwise be eating “real” sugar. You have find what works for you. These fabulous cookies are flavorful, soft, and just sweet enough. 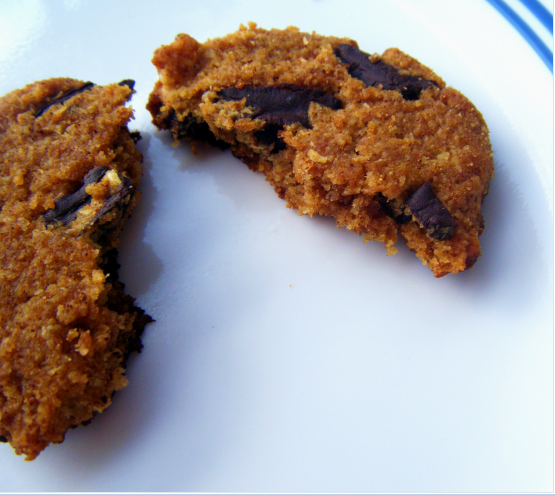 The recipe was inspired by this wonderful basic cookie by Batspit at the Active Low Carber forum. If you can tolerate dairy, definitely use butter in this recipe for the most flavor. The slight cooling from the erythritol is not distracting, but “refreshing,” as my roommate and faithful tester phrased it in her lovely British accent. That was the problem with every cookie recipe I had tried before–the erythritol would make the pastry feel like a mint the minute it hit your tongue. Not very chocolate chip cookie-like. The key ingredient here is xanthan gum, so if you haven’t invested in a bag, do it now. I mean it! Grab your keys, drive to the health food store, and make a positive change in your life by buying this miraculous gluten replacer. 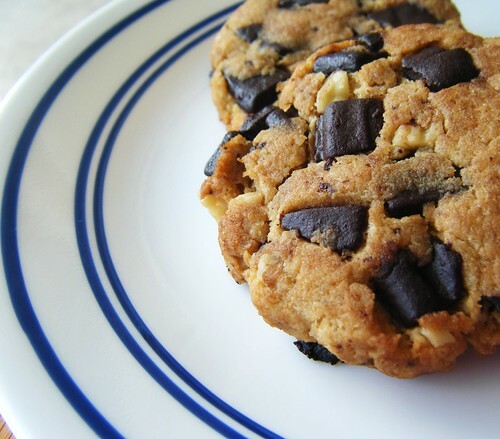 It keeps the erythritol from causing its mischief, leaving you with a tray full of pleasantly sweet chocolate chip cookies instead of icy pucks. Other reasons to buy xanthan gum: It thickens smoothies, ice cream, homemade salad dressings, keeps your gluten-free quickbreads from crumbling, and stabilizes whipped cream for longer term storage. A little bit of it goes a long way, so use a light hand or you’ll end up with barbeque sauce flavored pudding… not that I would know! If you want to save time, pick up some 73% cacao chocolate disks from Whole Foods. I used El Rey’s Apamate Chocolate, but Dagoba makes a nice product as well. No, the chocolate isn’t super low carb, but you’re only using a touch of luxurious chocolate in these adorable drop cookies. Just remember that it’s not a healthy indulgence if you eat the whole batch at once! I recommend just baking these cookies as you’d like to eat them, both to aid in portion control and to experience them at their peak–warm from the oven. Like most gluten-free baked goods, you don’t want to wait around to indulge. 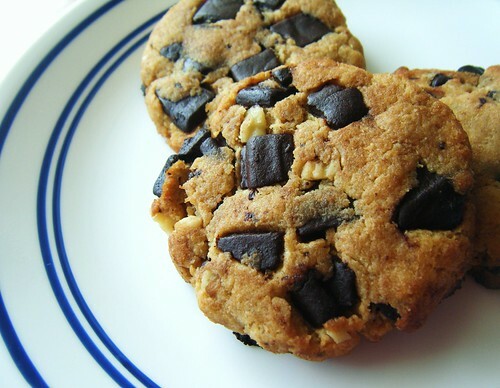 A quick zap in the nuker can also restore these cookies to their former glory. Keep the dough in a ball in the fridge and pop a couple of cookies in the toaster oven when you need a sweet escape from the madness. 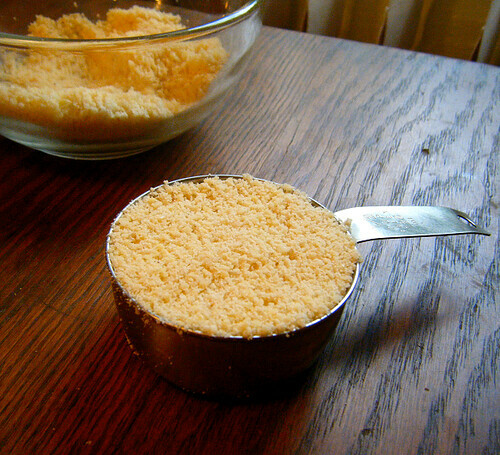 Powder erythritol with sea salt in coffee grinder or magic bullet (use the flat blade). Melt butter or oil in mixing bowl with the microwave, using 15 second intervals. Whisk in eggs and vanilla. Whisk in erythritol, sea salt, stevia extract, and blackstrap molasses. Pulse coconut flakes into a powder in magic bullet, if desired. Mix the rest of the dry ingredients together and stir into wet ingredients, adding nuts and chocolate chunks after the dough comes together. 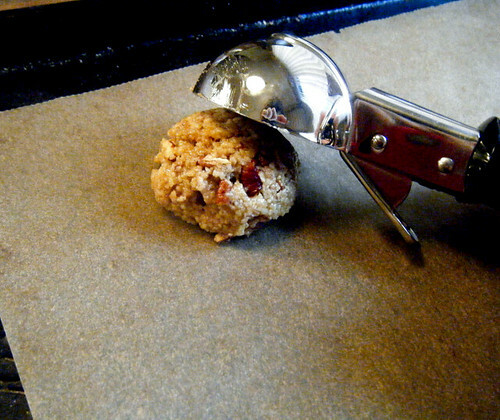 Shape dough into balls and squish on an ungreased cookie sheet with the clean bottom of glass–these cookies will not spread. 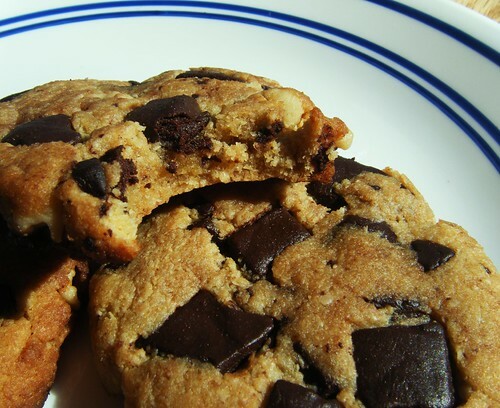 If you are making the drop cookies, omit the blackstrap molasses and press chocolate drops into the tops of your cookie dough rounds, smoothing the edges with your fingertips if they crack. Bake for 10-12 minutes, until barely brown on the bottom. You don’t want to overcook these and dry them out! Let cool completely on the cookie sheet without touching, then remove from the pan and store in an airtight tupperware container. Nuke in the microwave before consuming for maximum enjoyment and gooeyness! Serve with unsweetened almond milk, flavored with a touch of stevia. Dairy-Free Option: Use coconut oil or palm oil based shortening (shortening NOT recommended, as it doesn’t add any flavor) in place of butter. Use full fat coconut milk in place of the cream added to the chocolate chunks. 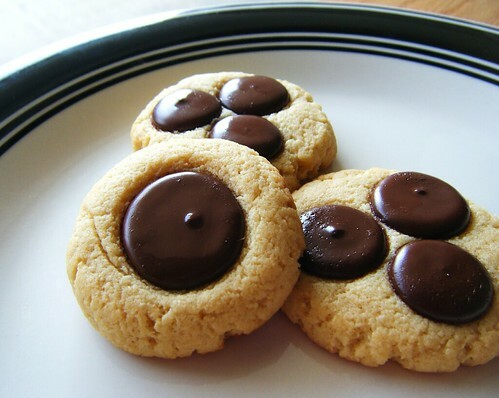 Dainty little drop cookies wearing cute chocolate buttons. Aren’t they adorable? 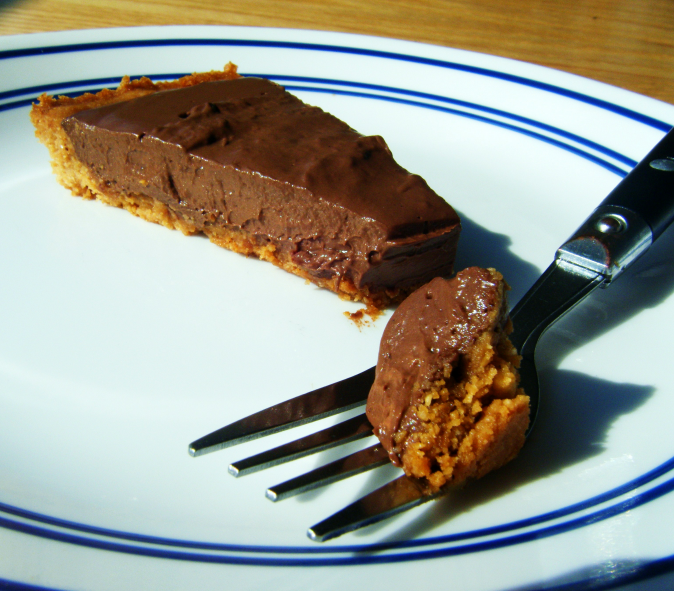 chop chocolate bar and add powdered erythritol. Microwave for 30 seconds on HIGH and stir. Mixture will be clumpy. Heat for 15 more seconds and stir until chocolate is smooth. Microwave in 10 second intervals to melt completely if necessary. Stir in stevia and pour into a pan lined with parchment paper. Quick set in the freezer for 10 minutes. Chop into chunks and store in a zip top baggy.